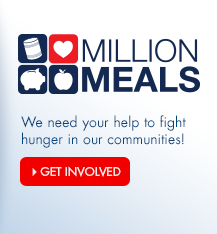 How will I earn Arvest Flex Rewards™ points? Earn points every day by using your Arvest credit card at your favorite local and online retailers, restaurants, and anywhere else you make purchases. Credit card transactions earn 1 point for every $1 spent on eligible purchases. Additionally, Arvest will alert you when a new bonus opportunity is available, so be sure to sign up for email notifications on the “Profile/Alerts” tab on arvest.cardmanager.com. To activate bonus earning opportunities, log in to your account and select “View Rewards” in Quick Links. Once there, select the “ACTIVATE” button to start earning bonus points. 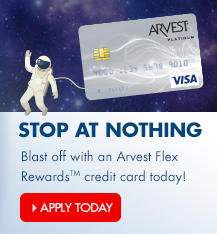 Please note: To earn Arvest Flex Rewards™ points, you must have an Arvest credit card. 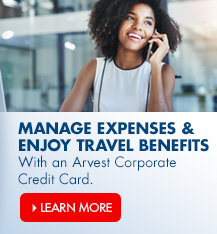 PIN-based transactions, traveler’s check purchases, balance transfer checks, and cash advances do not qualify for Arvest Flex Rewards™ points. 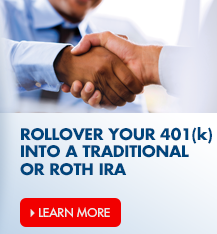 How can I get information on the Arvest Flex Rewards™ program? 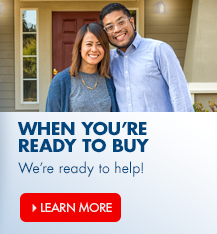 Can I redeem Arvest Flex Rewards™ points for cash back if I don’t have an Arvest Bank checking or savings account? What happens to my Arvest Flex Rewards™ points if I decide to close my credit card account? If I have both personal and business credit cards, can I pool my Arvest Flex Rewards™ points?